We use the clinically proven LHE method for skin rejuvenation. Safe, immediate and low impact we have been using LHE for hair removal for over a decade and are delighted to offer it for skin treatments. What is LHE (combined Light and Heat energies)? LHE works on the principle of selective photothermolysis, but utilizes both light and heat to achieve maximum efficiency. What skin issues can LHE treat? What LHE machine do you use? 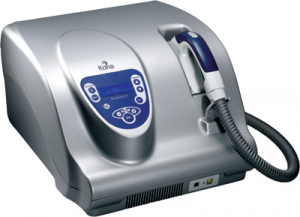 The Kona LHE machine, delivers a wide range of safe and effective skin rejuvenation treatments. We use the Kona LHE (combined Light and Heat energies) machine. Kona LHE is manufactured by Radiancy a world leader in medical, aesthetic and consumer skincare and is FDA approved. For medical and aesthetic skincare LHE machines are known for their ability to deliver high demand treatments for all skin types with unmatched efficacy and safety. LHE treatments are performed using a handpiece that delivers a broad spectrum of light and heat onto the skin’s surface. This light and heat penetrates into the skin tissue to stimulate the cells beneath the skin’s surface, and triggers the body’s response to eliminates injured tissues and dead skin cells, and promotes collagen production. In addition to improving uneven skin colour, sun damage, facial redness (Rosacea), and pigmentation, the heat energy stimulates new collagen production beneath the skin surface, firming and rejuvenating the skin. After a series of LHE treatments skin will appear more luminous, brighter and smoother. LHE treatments are typically administered in a series of 4-6 treatments performed at intervals of a minimum of 4 weeks. Spreading the treatment over this period provides a gradual improvement of the skin, and preserves the important “no downtime” feature of the program. Is LHE the same as Laser? LHE technology is based on the same principle as laser but emits a broad spectrum of light and heat to reach several layers of the skin simultaneously, improving the texture, quality, colour and health of your skin. It can treat multiple conditions simultaneously; including broken veins and capillaries, redness of the skin, age spots, and pigmentation. In addition to improving uneven skin colour, sun damage, facial redness (Rosacea), and pigmentation, the heat energy stimulates new collagen production beneath the skin surface, firming and rejuvenating the skin. After a series of LHE treatments skin will appear more luminous, brighter and smoother. LHE can cause slight swelling and redness in the treatment area, especially in areas where the skin is very thin or especially fragile. However, any redness or soreness typically subsides within a few hours after the procedure. Discomfort – a hot sensation may occasionally last for up to an hour after treatment. A cold compress or ice pack may be used if desired.